This week I continue my search for a readily available monster beer. While I try to maintain a cupboard full of big, interesting beers to enjoy I’m very aware that I spend an unhealthy amount of time in specialist beer shops and buying too much beer online. Less beer-obsessed people may be more interested in beers they can find in their weekly shop! So here we have Chimay Blue, picked up in our local supermarket. 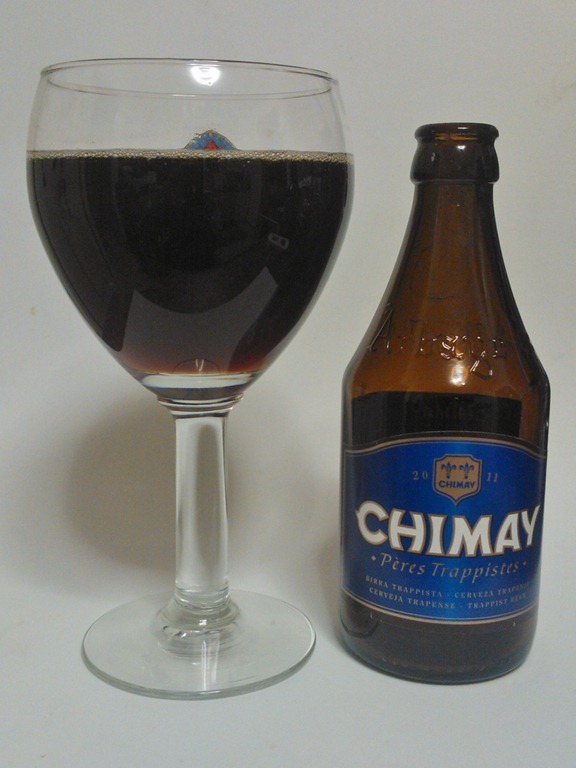 Chimay is one of the better known producers of trappist beers (and, apparently, cheese) from Belgium and they have three beers in their lineup. 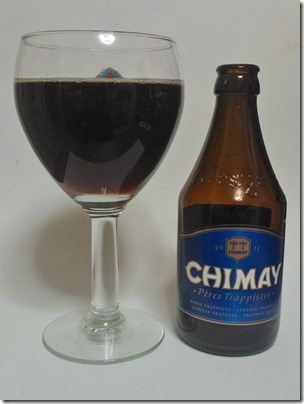 Chimay Blue is the strongest of the bunch, coming in at 9% ABV. It pours a nice dark reddy brown in the glass, with an unexpectedly short lived head. The nose is enticing – sweet dark honey with raisins, and a gentle alcohol heat mixing in too. The first thing that strikes you in the mouth is the high carbonation; I’m not used to so much fizz in a big beer. There’s a decent alcohol kick and a wonderful sticky sweetness that’s cut back nicely by those bubbles. Allow them to dissipate in your mouth and a warm black treacle flavour comes through, not too sweet, and with a surprisingly light body. It’s a very tasty beer, but a little one dimensional. I’m used to a deeper complexity in this style of beer; it’s a delicious drink but it leaves me wanting more. A big beer certainly, but I’m not sure even at 9% it’s a monster. On the other hand, it’s one of the most widely available big beers and for that alone it deserves some love.